Thanks to Educlips for the Eyes! In my last post I talked about the importance of teaching a student to attend to the instructor before delivering instruction. However, over time, how I teach this skill has changed significantly. It’s a little like the videos that were in the first post on DTT of old school DTT and contemporary DTT. In the “old” days, back when many of you were playing school in your backyard, we used to teach attention by focusing on eye contact using a shaping protocol. The instruction we used was typically to tell the learner to “Look at me.” We then reinforced increasing lengths of eye contact–2 seconds, 5 seconds, etc. If the student didn’t look at us, we turned his/her heads toward us and sometimes tried to “capture” his or her eye contact by shading their eyes so that other distractions were removed. I have to say, that part never really worked for me. Guess what, you can’t actually MAKE someone make eye contact. Even if you move someone to look in your direction, it doesn’t mean his eyes will meet yours. In addition, there are a number of adults with ASD (self-advocates) who talk about how terrorizing and difficult this was for them. In addition, let’s think about what it means to teach someone to make eye contact for up to 10 seconds. When you spend a lot of time teaching eye contact, you (or at least I) spent a lot of time realizing that I didn’t make a lot of eye contact. Now, I’m not a terribly outgoing person, but I would say I do OK socially. However, even in a conversation, people don’t make steady eye contact. They look at you and look away and then look back. So not only was this not terribly effective, but we were teaching the wrong skill. If someone stares at you, you probably don’t engage with them–unless you are in love with them…and that’s another story (and another skill set). Because here is what happens in most situations. People only say “Look at me” when you aren’t paying attention and aren’t doing what you are supposed to do. The first thing most teachers say when you don’t follow the class direction (a skill we also need to teach) is the child’s name. Essentially we were teaching kids to only respond to directions when their teacher / parent / caregiver is really frustrated because they aren’t following directions. Focus on teaching them to respond to their names. Teach him that when he hears his name (remember, following group directions is a different skill so we aren’t there yet) he looks up at the speaker. Instead of using a shaping program that increases the length of eye contact, focus on a shaping program that increases the distance from which you can call his name and have him respond (at the desk, in a group, across the room, down the hall, etc.). When he can do the first we move to the next one as the program. (I’ll talk more about shaping and programs later in the series). So, let’s not teach staring as a skill…our teaching has progressed beyond that. Also, when you develop any type of program, think about how it plays out in the “real world” that the person is living in. How do people talk, what do they say, and what behaviors do they expect. As a parent of an autistic child, I do find myself saying "Look at me" quite often when I am directing and speaking to my son. He will look at me momentarily and then look away, usually still not paying attention. I sometimes have to repeat myself a few times, until I know I have his attention. I am excited to read the next post in your series. Thank you for sharing your knowledge! Thank you. I've decided over the years that we say "Look at me" when we are really frustrated with someone because we realize we are talking and they aren't listening. We do it with children but often with adults as well. Clearly there are other times we say it as well, but usually it's not our first attempt. Thanks for reading! Great post. I used to spend forever trying to teach kids NOT to look at me, because the answer wasn't "up here" it's "down there" – on the paper, in their communication system, wherever – anywhere but in my face. Yep, that's part of the problem…I'm actually going to talk about that when we talk about materials. Thanks! Hi Chris, I just discovered your blog and I am so thankful! I am an SLP and have worked throughout the years with kids who are autistic. It always made me feel kind of weird to say Look At Me so I tried so hard not to (and I never ever wrote a goal for that). Now for the first time in my 23 year career (yikes!) I'll be in a middle/high school setting. I will definitely be looking to your blog and resources to help me navigate the world of teenage students with autism…and who are all taller than I am! I'm so glad you found me! Yeah, middle / high school is definitely a different world! Thanks for reading! Very helpful post! Thank you for your insight. Such great, useful information! As always :0). Thanks so much for being willing to share your expertise. 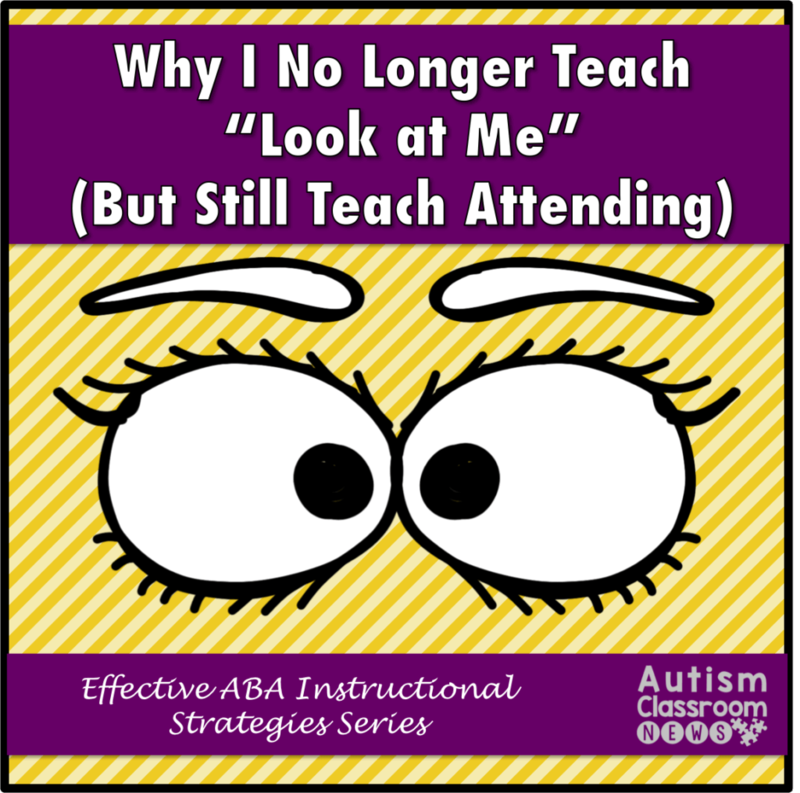 When you are speaking to a whole class – I'd rather not call out a students name…..I'd rather say "look at me" but I see what you are saying and I see that I should stop saying "look at me"
What should I say instead?? I'm not sure–I think it depends on what you usually say and what other teacher's say that the student may interact with now and in the future. Then I would use whatever that might be. In some places they might say, "Look at me" in which case it makes sense to teach that. In others they may call his name. Then teach that as an attention-seeking cue so that he will be successful in those environments. I hope that makes sense. Thanks so much for reading! This was a very interesting post (and I can't believe I've only just found your site!) I work with an autistic boy, who responds to both his name and 'look at me' quite well. However, I've never expected eye contact from him (quite frankly eye contact terrifies me too) and I praise any looking in my direction, however fleeting, before giving an instruction/asking a question. Basically, I just want an indication that he has shifted his attention to me, and I think he kind of realises that. I've recently learned to give between 7 and 10 seconds for a response before repeating myself, and it really works. Anyway, I look forward to reading more on your site!